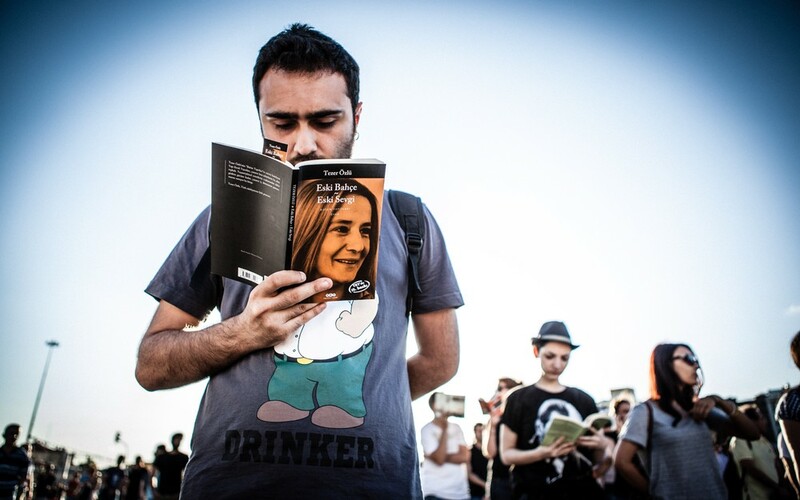 Protesters stand silently and read books in central Istanbul, in stark contrast with scenes of violence. After weeks of violent clashes between police and protesters across Turkey a new form of resistance has emerged – the “Standing Man”. Standing silently, and initially alone, Turkish performance artist Erdem Gunduz stood, with his hands in his pockets, facing the Ataturk Cultural Centre in Taksim Square, Istanbul, for eight hours. With extraordinary speed, Gunduz become the latest symbol of the resistance movement. In days that followed, thousands of people would emulate his solitary act, standing silently, for minutes or hours, in places across Turkey. The contrast with the images of tear gas clouds and water cannon could not have been greater. Faces obscured by masks and helmets were revealed to show expressions of quiet contemplation. Violent scenes are still occurring around Turkey, including in Istanbul once again this past weekend, but the Standing Man protests continue unabated. The following images explore one aspect of the protest in Taksim Square, ongoing since before the communal standing took off. 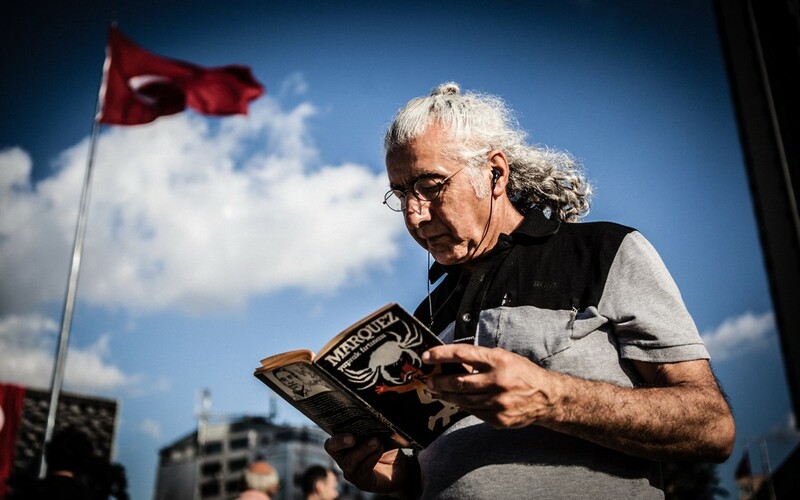 Public reading and informal education has been notable since the earliest days of the protest, but has since merged with the Standing Man to form “The Taksim Square Book Club”. 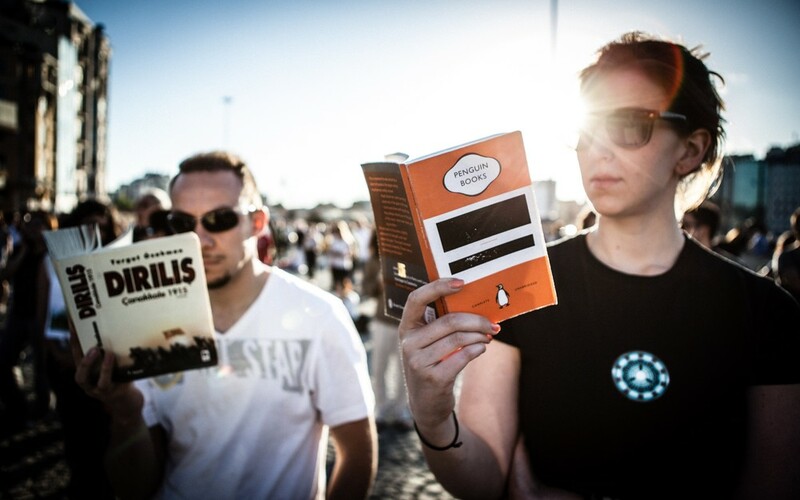 The chosen reading material of many of those who take their stand is reflective, in part, of the thoughtfulness of those who have chosen this motionless protest to express their discontent. 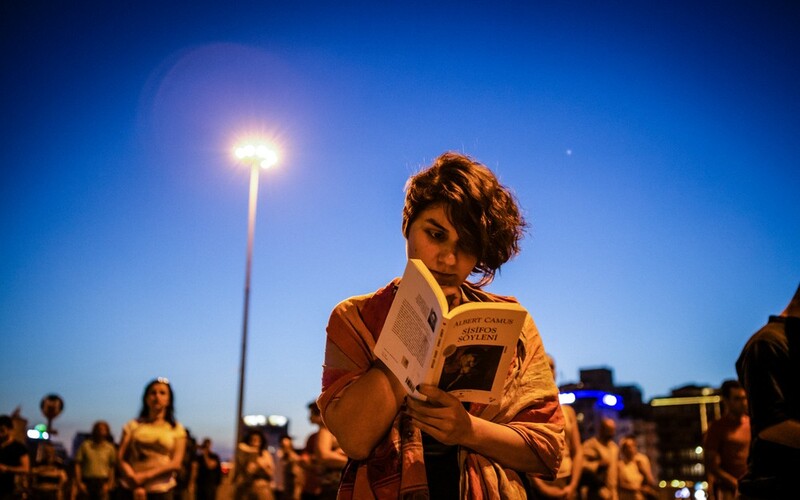 A woman reads the philosophical essay The Myth of Sisyphus by French author Albert Camus in Taksim Square. 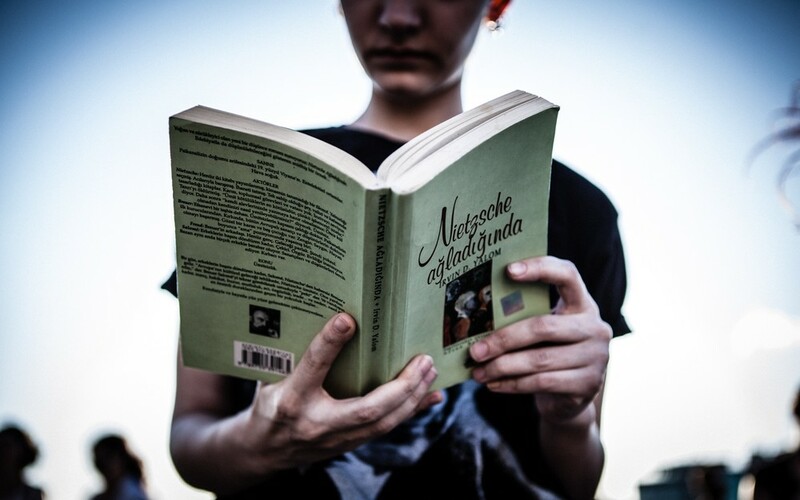 The book focuses on the search for meaning in the absence of God. Gabriel Garcia Marquez’s Leaf Storm centres on a family in limbo following the death of a man passionately hated, yet tied to the family. Turkish writer Tezer Ozlu’s book, Old Garden – Old Love, is a collection of short stories. Irvin David Yalom’s historical novel When Nietzsche Wept is about a prominent physician, Josef Beuer, falling in love with Lou Salome, who was believed to have spurned Friedrich Nietzche’s romantic overtures. 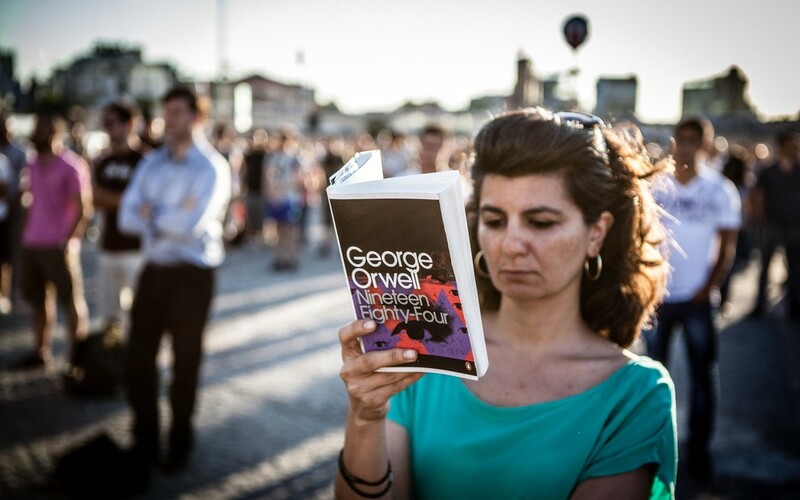 A man reads the Turkish book Resurrection Gallipoli 1915, written by Turgut Ozakman on the Battle of Gallipoli, while a woman beside him reads George Orwell’s Nineteen Eighty-Four. George Orwell’s dystopic novel Nineteen Eighty-Four centralises around a police state with total government surveillance. This entry was posted in Images, Literature, News on 24 June 2013 .